There are three factors influencing a child in the Montessori classroom – environment, teacher and teaching materials. In traditional schools the teacher often takes centre stage imparting knowledge through her resources and expecting children to learn from her in a group situation. This arrangement limits the scope of children’s learning as it is mainly undertaken in the abstract and children do not control the amount of repetition. In the Montessori classroom the environment is dominated by the interaction between the children and materials and not by the teacher. The teacher’s role is to maintain this environment and to supervise the children; s/he needs to make sure that the materials are set out in a specific order and that they are complete and tidy as the children will be learning through the environment. 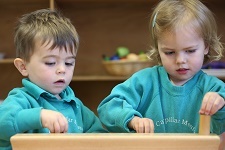 Dr Montessori believed that a reliable, consistent and uncluttered environment helps children to organise their mental and physical development. In a classroom where things are reliable children can go about their activities freely without having to ask for items or wait for the teacher’s permission. The atmosphere in a Montessori classroom is purposeful and productive without the need for constant interaction between the child and the teacher. A predictable and orderly environment also fosters children’s independence and self-confidence. Children will always know where to find a specific activity they are interested in; they are free to choose any activity and have the freedom to spend as long as they like doing it and to repeat it as many times as they wish. It is obvious how some of the activities from the Practical Life area such as dressing frames help the child to become more self-confident through acquiring new skills. The aim of other materials such as Pink Tower – an early mathematics activity, can be more indirect. The freedom of choice in a Montessori classroom is the consequence of a carefully laid out environment in which all choices are good in a sense that they all offer children the opportunity to challenge, refine or acquire a new skill depending on their interests. Montessori saw that children went through a specific period during a morning’s work when they appeared restless and seemingly ill at ease. Rather than interfere, however, she let the children carry on. What became apparent was that this period was critical as a build up to the higher level work that was to follow. The ‘false fatigue’ as she called it, allowed the child to prepare themself in their own time. Children who were allowed to complete full cycles of work seemed to demonstrate the need for periods of calm reflection on the tasks that they had accomplished. It appeared that the natural work cycle of a child that had begun to concentrate was about three to four hours and the more that a child was able to complete their own work cycles, the happier, more self-disciplined and self-motivated he became. A lengthy work cycle is beneficial to spontaneous activity and independent learning; it also guarantees the freedom of repetition. The teaching materials designed by Montessori are divided into groups. These consist of Practical Life, Sensorial, Literacy, Mathematics, and cultural materials such as History, Biology and Geography.